La-La Land Records, Paramount Pictures and The Carmen Dragon Music Library present the world premiere release of composer Carmen Dragon’s (COVER GIRL, WHEN IN ROME, KISS TOMORROW GOODBYE) original motion picture score to the classic 1956 sci-fi chiller INVASION OF THE BODY SNATCHERS, starring Kevin McCarthy, Dana Wynter and Larry Gates, and directed by Don Siegel. 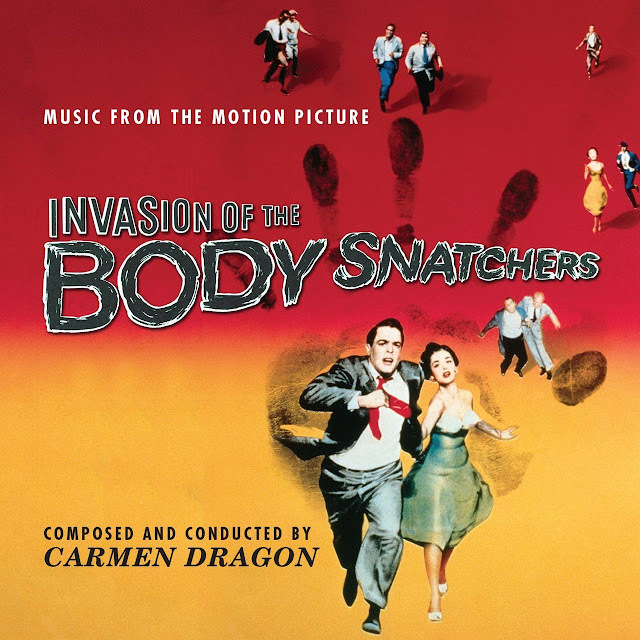 Renowned composer/conductor/arranger Carmen Dragon creates an astoundingly complex and groundbreaking work, (his inventive use of low, staccato piano notes for suspense would inspire many composers to do the same) that perfectly emboldens the film’s sci-fi terror and paranoia, while never neglecting the story’s human emotions or its psychological and sociological underpinnings. Produced for La-La Land Records by Carmen Dragon’s son-in-law, Richard “Rick” Henn and Neil S. Bulk, and restored and mastered by Stephen Marsh and Fernando Lee, this limited edition release of 2000 Units includes source music bonus tracks and features exclusive, in-depth liner notes by film music Jeff Bond, with a special note from album co-producer Henn. Dan Goldwasser’s sharp art design completes a must-have score release that will take over your entire being. This is an expanded CD release.